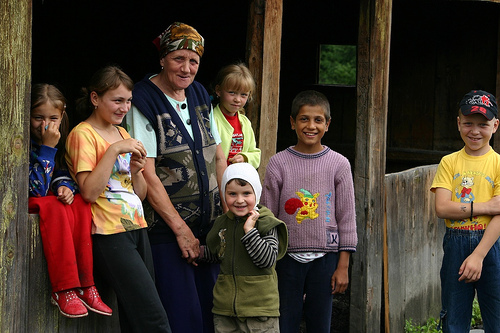 In Romania, about 90% of the population is ethnically Romanian. The biggest minority groups are Hungarians and Roma. About 90% of the country speaks Romanian as a first language, and about 7% speak Hungarian, especially in Transylvania. Romanian society follows a hierarchy and people respect those of old age and position. There is a high regard for elders and their wisdom, so they will often hold the responsibility of making decisions on behalf of the rest of the group. People also are expected to acknowledge titles. Traditionally, families are very tight-knit, and people depend on their family network for assistance. They also follow a patriarchal hierarchy, where fathers are in charge of their families. Romanians tend to be private, formal and reserved, and are usually not very open to strangers. They will probably appear shy and not outspoken, and they respect people who are modest. They will be more comfortable with people down the line, but it takes time to build this relationship. In regard to greetings, they are generally reserved and formal. A typical gesture is a firm handshake and eye contact. Older Romanian men may kiss females’ hands when greeting, but foreign men are not expected to do this. People who are close friends may hug and kiss when they meet, but this seldom will happen with strangers. You should address people by titles, by saying “Domnul” for Mister and “Doamna” for Misses, and their last name. Friends may even call each other by title and first name. Do not start calling people by their first names until you are invited. If you are invited to a Romanian household, it is polite to bring chocolates, flowers or imported liquor. Flowers should be given in an odd number, as even flowers are used for funerals. Roses and carnations are good flowers to give. You should arrive on time to dinner. If you are invited to a party, it is fine to arrive up to 15 minutes late. Dress formally, like in clothes you might wear to work. Check the door to see if you should remove your shoes. At dinner, you should wait to be told where to sit. You should leave your napkin on the table, and wait for the hostess to invite everyone to eat. Your hands should always show during dinner, and you should rest your wrists at the edge of the table. It is normal to be offered second and third helpings, so when you are full, just say that you cannot eat any more. I’m afraid that these are some old customs you have posted here and things have changed a lot in Romania in that past years… many at that too. This is something more common for the society in the period between the two world wars. Romanian society nowadays is not at all as traditional as it is described in this post. Most Romanian people are friendly and open, and regarding formalism, that one is quite lacking at times especially amongst young people. Some of these customs here may still apply for the older generations, but young people today are pretty far from this. They’re pretty much like young people everywhere in the world. You know, i agree completly with Dana, assumming she is Romanian too. Some of these traditions are still carried on in the older generation, however, youth do not respect their elders as highly as before.